Graphene is considered the jack-of-all-trades of materials science: The two-dimensional honeycomb-shaped lattice made up of carbon atoms is stronger than steel and exhibits extremely high charge carrier mobilities. It is also transparent, lightweight and flexible. No wonder that there are plenty of applications for it – for example, in very fast transistors and flexible displays. A team headed by scientists from the Max Planck Institute for the Structure and Dynamics of Matter in Hamburg have demonstrated that it also meets an important condition for use in novel lasers for terahertz pulses with long wavelengths. The direct emission of terahertz radiation would be useful in science, but no laser has yet been developed which can provide it. Theoretical studies have previously suggested that it could be possible with graphene. However, there were well-founded doubts - which the team in Hamburg has now dispelled. At the same time, the scientists discovered that the scope of application for graphene has its limitations though: in further measurements, they showed that the material cannot be used for efficient light harvesting in solar cells. A laser amplifies light by generating many identical copies of photons – cloning the photons, as it were. The process for doing so is called stimulated emission of radiation. A photon already produced by the laser makes electrons in the laser material (a gas or solid) jump from a higher energy state to a lower energy state, emitting a second completely identical photon. This new photon can, in turn, generate more identical photons. The result is a virtual avalanche of cloned photons. A condition for this process is that more electrons are in the higher state of energy than in the lower state of energy. In principle, every semiconductor can meet this criterion. The state which is referred to as population inversion was produced and demonstrated in graphene by Isabella Gierz and her colleagues at the Max Planck Institute for the Structure and Dynamics of Matter, together with the Central Laser Facility in Harwell (England) and the Max Planck Institute for Solid State Research in Stuttgart. The discovery is surprising because graphene lacks a classic semiconductor property, which was long considered a prerequisite for population inversion: a so-called bandgap. The bandgap is a region of forbidden states of energy, which separates the ground state of the electrons from an excited state with higher energy. Without excess energy, the excited state above the bandgap will be nearly empty and the ground state below the bandgap almost completely populated. A population inversion can be achieved by adding excitation energy to electrons to alter their energy state to the one above the bandgap. This is how the avalanche effect described above is produced. However, the forbidden band in graphene is infinitesimal. "Nevertheless, the electrons in graphene behave similarly to those of a classic semiconductor", Isabella Gierz says. To a certain extent, graphene could be thought of as a zero-bandgap semiconductor. Because of the absence of a bandgap, the population inversion in graphene only lasts for around 100 femtoseconds, less than a trillionth of a second. "That is why graphene cannot be used for continuous lasers, but potentially for ultrashort laser pulses", Gierz explains. Such a graphene laser would be particularly useful for research purposes. It could be used to amplify laser light with very long wavelengths; so-called terahertz radiation. This type of laser light could be employed in basic research to study, for example, high-temperature superconductors. To date, terahertz radiation has been produced using comparatively inefficient, so-called non-linear optical processes. In addition, the available wavelength range is often limited by the non-linear material used. The recent findings indicate that graphene could be used for broad bandwidth amplification of arbitrarily long wavelengths. However, the Hamburg-based team also dashed the hopes of some materials scientists – as it turns out, graphene is probably not suited for converting solar radiation into electricity in solar cells. "According to our measurements, a single photon in graphene cannot release several electrons, as previously expected", Gierz says. This is a prerequisite for efficient conversion of radiation into electricity. 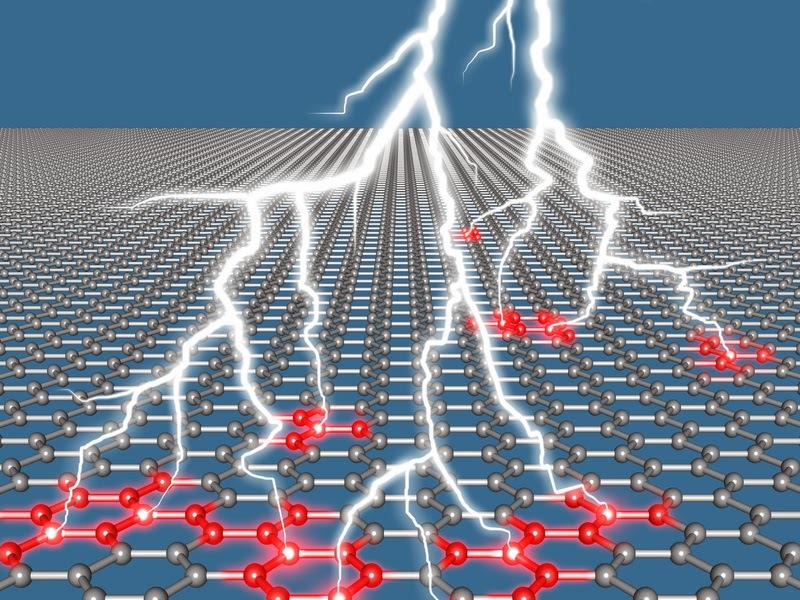 The scientists in Hamburg studied the graphene using a method called time-resolved photoemission spectroscopy. This involved illuminating the material with ultrashort ultraviolet (UV) light pulses. As a consequence the electrons are forced out of the sample and the physicists measure their energy and angle of exit. The resulting data is used to establish the energy distribution of electrons in the material. Time resolution is achieved by delaying the arrival time of the UV probe pulse with respect to an arbitrary excitation pulse. In the present experiment, the electrons in the graphene were excited using infrared laser light. Then the scientists employed photoemission spectroscopy to demonstrate the occurrence of population inversion. In a similar way, they established that carrier multiplication could not be achieved by radiation. The graphene was produced by the scientists through thermal decomposition of silicon carbide. According to Gierz, this procedure can also be used to make a graphene laser, since silicon carbide is transparent and will not interfere with terahertz radiation. However, the physicist admits that a lot of development work remains to produce a graphene laser. Gierz, I. et al. Snapshots of non-equilibrium Dirac carrier distributions in graphene, Nature Materials, 6 October 2013.